Chris Price, the North Yorkshire Moors Railway’s new general manager, is now eight months into his role. Gary Boyd-Hope went to meet him to find out how he has settled in and find out more about his vision for this ‘top flight’ preserved line. It’s probably not the greeting you would expect from the general manager of one of preservation’s greatest success stories, but Chris Price and I are old friends from our days on the Talyllyn Railway, and I’d frankly have been very surprised to receive anything more formal. He’s called me a lot worse over the years! I’d gone up to meet him in his Pickering office in mid-April to find out how he had settled in to his new position in charge of the North Yorkshire Moors Railway (NYMR). Chris took over the managerial reins from Philip Benham in early September last year, and was immediately faced with the prospect of having some very big boots to fill. Like Sir Alex Ferguson at Manchester United, or even our own Nick Pigott with The Railway Magazine, there are some people who become synonymous with their role, and Philip Benham was definitely in that camp. Following in his footsteps was certainly going to present its challenges. 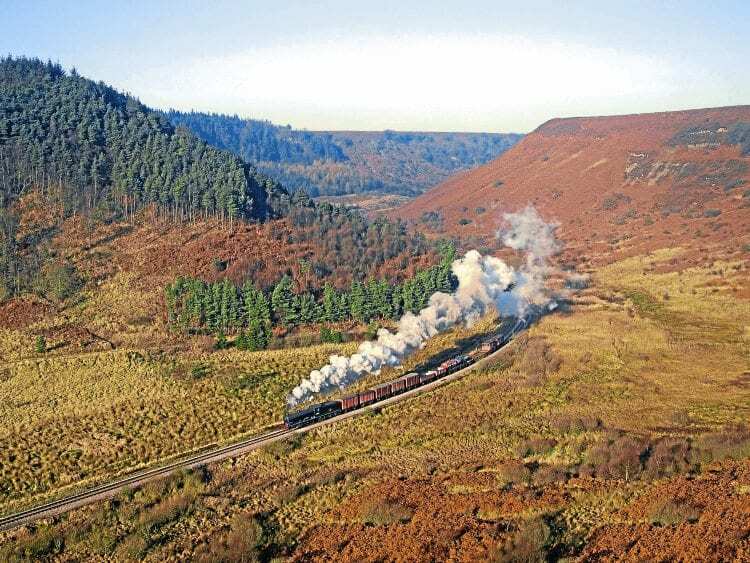 After all, the NYMR is undoubtedly one of the most successful preserved railways in the country, if not the world. With a £6million annual turnover, the 18-mile railway employs around 106 staff, which increases to around 150 during the summer. 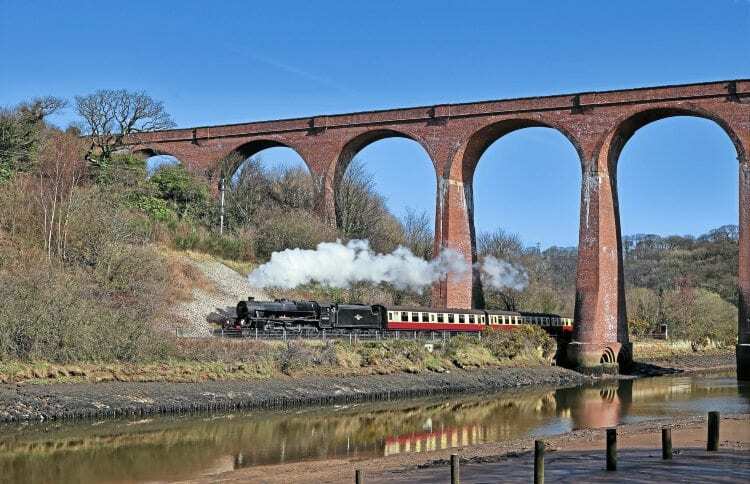 Its connections to the Heartbeat TV series and Harry Potter film franchise make it a ‘must see’ for many visitors to the area, and the extended operation beyond Grosmont to Whitby along the Esk valley line has given it an enviable tourist honey-pot destination. This is a big railway in every respect, and like other big organisations its finances have come under the spotlight in the past. Large bank overdrafts, repeated locomotive crises and financial drains have – perhaps unfairly – become associated with the NYMR, and a new manager would most certainly be kept on their toes. However, Chris is no newcomer to the industry, having risen through the preservation ranks, as it were, since he started as a Talyllyn Railway volunteer in 1981. Up until 1994 Chris had combined volunteering with his day job as a Corporal Technician with the Royal Air Force, but upon leaving the RAF he took a job working in the TR’s workshops at Pendre. He left to take over the management of the nearby Fairbourne Railway and latterly as estate manager and merger project manager of the Workers’ Education Association in Wales. He retained his TR links, however, and served as the chairman of the Talyllyn Railway Preservation Society for a number of years. When the role of general manger came up at the TR in October 2013 Chris was an obvious choice, and under his tenure the railway managed to shed much of its conservative image. 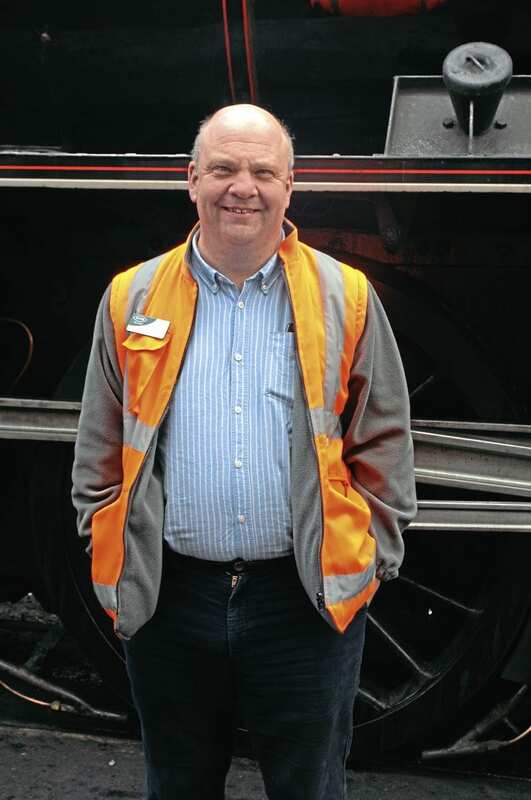 Prior to Chris’ appointment the TR had excelled at keeping its light hidden under a bushel, but with a supportive team behind him he was able to showcase the railway to the world, being instrumental in organising the successful 150th anniversary events of 2015. “As long as I had stayed on top of the job I could have stayed at the TR until I was ready to draw my pension,” Chris explained over coffee (no biscuits – typical!) when I asked him why he’d left Tywyn. “I had a great job, surrounded by great people and was very happy doing it. I wasn’t even looking to move on, but when the Moors’ position came up I admit that the opportunity to manage one of the biggest preserved railways in the country was very attractive. I needed to challenge myself. Chris and his wife Alison made the move to Yorkshire from Wales last September, when he set about getting to know the railway and understanding its operation, infrastructure, quirks, and curiosities. Eight months down the line, how has he settled in? “I feel I’ve settled in very well, thanks largely to the board [North Yorkshire Moors Historical Railway Trust] and plc board [North Yorkshire Moors Railway Enterprises plc], which have both been very supportive. when running 7¼ miles of narrow gauge in Mid-Wales, so I was keen to find out how Chris had found the change. “Although the actual management structure is similar to the TR, operationally it’s very different,” he said. “Oddly, it has parallels with the Fairbourne Railway. Like here, Fairbourne is operated more as a business – it has to be – whereas the TR, whilst business-like, wasn’t like that. A railway like the NYMR knows little in the way of ‘down time’, so any new manager would hit the ground running when taking over, as Chris found. However, with his feet now firmly under the table, what is his overall impression of where the railway stands? “There’s a perception in some quarters that the NYMR is a big operation that cannot afford to run itself, yet this is not the case at all. Yes, we use our overdraft, but that’s how this place works. Chris added: “Right now my priority is sorting out the motive power situation and making sure that we have enough steam locos available. That is our product. Diesels are very much part of the railway and we’d be lost without them, but my goal is to improve the reliability of the service and make sure that there’s a steam engine on the front of the train when it says there will be. That’s why we were so keen to bring No. 80136 to the railway as the Standard 4 tanks are perfect for this line. All being well we will have it in traffic by the summer. In 2007 the NYMR took the bold step of obtaining a main line operator’s licence, enabling it to run trains beyond its northern terminus at Grosmont and onto Network Rail metals for the six-mile run to Whitby along the Esk Valley line. It was, and remains, a unique situation for a British preserved railway, and has been a resounding success. At the time of writing the railway had three steam locomotives available for the Whitby services. These were BR ‘4MT’ 2-6-0 No. 76079, which the railway bought for this purpose in 2009, ‘Black Five’ 4-6-0 No. 45428 Eric Treacy and the North Eastern Locomotive Preservation Group’s Peppercorn ‘K1’ 2-6-0 No. 62005. These will soon be joined by ‘4MT’ 2-6-4T No. 80135, ‘B1’ 4-6-0 No. 61264 and ‘Schools’ 4-4-0 No. 30926 Repton, while ‘4MT’ 4-6-0 No. 75029 The Green Knight, ‘S15’ 4-6-0 No. 80135 and Bulleid ‘West Country’ Pacific No. 34101 Hartland will join the fleet in due course. Class 25 No. D7628 is also cleared for Network Rail running. “We had to borrow in order to expand into Whitby,” Chris continued, “but this wasn’t ‘Pay Day’ lending. The sums all added up and our mission now is to consolidate that investment. Despite what may have been printed elsewhere, Whitby is not a drain on the railway’s finances and is a very lucrative enterprise. “It has had certain knock-on effects though. The takings in the shop at Grosmont have not developed since Whitby services began, owing to fewer people getting off the train, but the income from the trains more than makes up for this. We’ve got a shop at Whitby as well, so if anything the operation is a drain on resource, but not on the finances. As I said earlier, Whitby presents the best opportunity for growth we have, and I feel that there is still potential to be unlocked from this. If we can ensure that trains run there with more passengers, then we’ll be going a long way to achieving this aim. While Whitby has added an additional string to the NYMR’s bow, prior to the coming of Esk Valley services the railway was already reaping the benefits of worldwide media coverage. Between 1992 and 2010 the village of Goathland became known to millions as ‘Aidensfield’ in the phenomenally popular ITV series Heartbeat. The show was staple Sunday night viewing, with the NYMR’s Goathland station making several appearances over the years. Consequently the village, and by default the railway, became a magnet for tourists, who continue to flock to the area. If that was not enough, in 2001 the railway, and in particular Goathland, gained a new and much younger audience when it starred in the film Harry Potter and the Philosopher’s Stone. With the exception of those scenes shot at King’s Cross, the NYMR was the location for all footage of the ‘Hogwarts Express’ in full cry; Goathland doubling as the fictional village of ‘Hogsmeade’. As a result the railway provided parents with the ideal excuse to keep the kids quiet as they took them for a ride in the footsteps of the famous boy wizard. Such boosts to visitor numbers have naturally been a boon to the railway, but in many respects it has become a victim of its own success. Operational capacity cannot be increased any further as things currently stand, with Pickering already seeing eight departures each day during the ‘Gold’ timetable period. Such limitations have an impact on the line’s ability to lay on a successful gala, something Chris has given a lot of thought to. “I think the days of the traditional steam gala are numbered,” he explained. “There are only a finite number of suitable locomotives out there which can be hired in, many of which have been here before, and which will provide a big enough draw. By the time you account for transport fees and the like, coming up with a business case for a gala gets harder and harder, especially when compared to events like our wartime weekends. Such suggestions are not idle musings as Chris has first-hand experience of the effect a ‘big name loco’ can have, especially when said loco is arguably the most famous in the world. Between March 12-20 this year the NYMR played host to the National Railway Museum’s celebrity ‘A3’ Pacific No. 60103 Flying Scotsman, the visit of which proved to be a far greater success than anybody could have imagined. However, it was suggested in another railway title recently that certain railways are hiring in the likes of Flying Scotsman instead of laying on a traditional style gala in order to guarantee a good turnout/profit. In doing so they lose the loyalty of the enthusiasts who are uninterested in such mass-market pandering, and who therefore switch their allegiance elsewhere. Although no railways were actually mentioned, it was clear that the comments were levelled at the Severn Valley Railway, which for this year has abandoned its autumn gala slot and instead is hosting both Flying Scotsman and new-build ‘A1’ Pacific No. 60163 Tornado in a preservation ‘first’. As the first railway to host ‘Scotsman’ since the completion of its repaint into BR Green, I was interested to know where Chris stood on this. “We did exceptionally well out of the ‘A3’s’ visit, and its effect will be to significantly reduce the NYMR’s borrowing, so I am very happy. “Events like that give us the financial boosts we need in order to improve the product we deliver. If we didn’t do them, or fill our trains every day, we wouldn’t be here to support the enthusiasts at all. 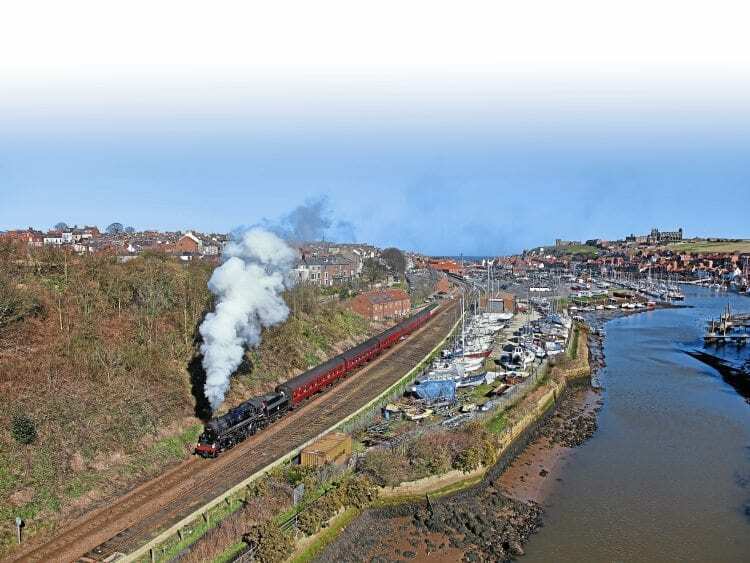 “The Severn Valley has come in for a lot of flak over its decision, but I’d have done the same thing. Opportunities like this don’t come up every day, and if we don’t capitalise on them while the media circus is still running, we limit ourselves in the future. Without the sort of revenue ‘Scotsman’ brought in, we wouldn’t be able to hire in locos for other galas. What became clear while talking to Chris is that the North Yorkshire Moors Railway, and many others like it, have moved beyond simply running trains for pleasure and are now very business focused. They have to be in order to be sustainable. Yet would it be fair to say that they have moved away from preservation? “If I’m honest, yes!” answered Chris. “The preservation movement has changed dramatically in the 22 years that I’ve been earning a living from it. “The days of ‘let’s save it’ have passed, and now we are asking pertinent questions like why we should save it, and do we really need to? You could say that the industry has grown up. “A lot of it is down to the funding that is available now. The Heritage Lottery Fund, and groups like the A1 Trust, have moved the goalposts, and in many respects locos are being managed as liabilities as well as assets. For us to put a loco through overhaul now requires a strong business case, whereas 20 years ago it wasn’t like that at all. Back then locos were being returned to steam for preservation’s sake alone; they didn’t seem to need a reason. “In a similar vein, we now buy new rail. When we need some it gets ordered in from Scunthorpe, but 20 years ago we were still sending working parties out to lift abandoned sidings on the network so that the rail could be reused. But what of the perceived volunteer and skills shortage that is often talked about? Surely to be sustainable you need the people to make it happen, and some railways have publically said that they are struggling to recruit new volunteers. “Personally, I’m not convinced that there is a shortage of new blood coming into the movement. There are a lot of railways, such as the Talyllyn and the NYMR, which have a very strong youth element with more people volunteering all the time. And what of the skills shortage? “Again, whilst I am sure there is one, we have taken steps to negate the effect. We have recently taken on four new members of staff as a direct result of apprenticeships that we have provided, and thanks to initiatives like that provided by BESTT [Boiler & Engineering Skills Training Trust] we could take on more. So what’s next? Chris had painted me a frank and honest picture of the railway he had come to and where he felt its current position lay. What was evident through talking to him was his passion for the railway, even after only eight months, and his determination for it to realise its full potential. “For one thing we are aspiring to create a new facility for education and heritage. What format this will take I cannot say at the moment, but the likelihood is that it will be something akin to the Engine House at the Severn Valley Railway. We’re also taking the early steps to moving the ‘Moorlander’ Pullman dining set down from Grosmont and stable it at Pickering. The dining trains are a massive part of what we do (it turns over £1.5million) but most start at Grosmont. “It makes better economic and logistical sense to start them from Pickering, so we’re clearing out the long siding of redundant stock and possibly turning it into a loop, and the Pullmans will then be based there. Anyone who has ever been to the NYMR will know that car parking in Pickering is no easy feat, particularly during the high season, with spaces at a premium. Would having diners join the trains there rather than Grosmont only serve to exacerbate the problem? I had found talking to Chris in a professional capacity very enlightening. Even though we go back a long way, I realised that our previous dialogues had always been either part of a larger messroom banter or over a pint in the evening, most often discussing our shared love of motorcycling and the Darjeeling Himalayan Railway. This was one of the few occasions where I’d talked to Chris the businessman, and in spite of his less-than-formal greeting, I confess that I was very impressed. He told me before I left that he’d like to see the NYMR as “a railway that people looked at with a jealous eye”, and I honestly believe he is the man to do that. His vision for the NYMR is clear cut and totally achievable, and I’m confident that we will see the railway grow and expand with Chris Price in the driving seat.